"In 1960, a young Englishwoman named Jane Goodall stepped into the African bush to embark upon one of the greater scientific adventures of our time. Her pioneer studies of the wild chimpanzee have won Dr. Goodall international scientific acclaim and have given both scientists and laymen a totally new perspective on human behavior. . . ."
"The chimpanzee's physique, brain structure, body chemistry, and much of its social behavior make it the animal most like humans. Dr. Goodall's long-term research and her investigations in the chimpanzee's natural habitat demonstrate the chimpanzee's range of complex behavior and reveal similarities to humans not previously discovered." "This film is one in the series on Dr. Goodall's work. In company with the old female, Flo, and her offspring, the viewer meets up with the individuals and groups that comprise chimpanzee society at Gombe. In the film, the "omnivorous" chimpanzees search for food in the trees and on the ground, using tools where lips, teeth, and fingers cannot do the job. 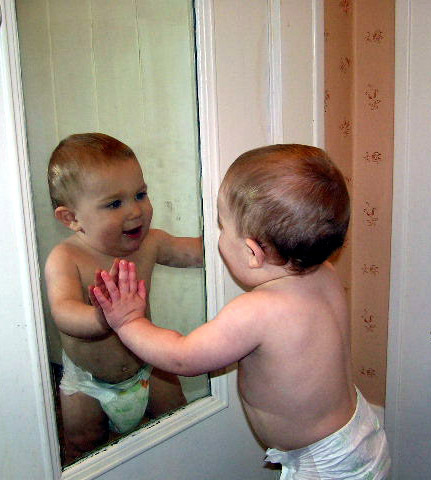 Infants struggle to walk, and youngsters learn the rules of their society through observation and imitation. Disputes erupt and are settled by bluff or an occasional fight. 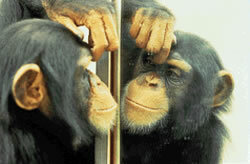 Many subjects treated in depth in the chimpanzee film series are briefly discussed in this film. The last quarter of the film discusses recent developments, such as intragroup cannibalism and intergroup violence." Chimps also use other tools: they use leaves as sponges, with which they get up to eight times more water from a tree branch than by using their fingers alone; they use weapons (as a type of tool) to scare away the baboons. Youngsters like Fifi learn from older chimps; hence the skill is passed on by learning. One male, Mike, rose to the top of the hierarchy by intelligence rather than by strength, by rolling a noisy can. Orignally one of the lowest ranking males, Mike became #1, the "alpha male"
"warfare," "gang attacks," "killing and cannibalism"
Although chimps seem miserable in the rain, they make little effort to seek shelter during a downpour. They do, however, occasionally perform a "rain dance." Chimp studies provide models for interpreting prehistoric primates, as sort of an "ethnographic analogy." By 1984 Jane Goodall's chimp studies had become the longest continuous study of any animal group in the world; and they continue through the present. Chimps are animals of great extremens (e.g., noisy - calm . . .). Chimps systematically hunted other chimps, killed, and ate them. Three to six adult male chimps attacked victims in "gang attacks" ("brutal attacks"). Chimps get human diseases (e.g., polio). the rainy season brings fertile, winged termites, which the chimps harvest with tools (they are better at fishing for termites than some humans; baboons can get termites only on the serface. Baboons outnumber chimps at Gombe Stream 4 : 1. Chimps are as distinct from one another as humans. Jane Goodall gave them names. "Learned behavior [is] passed on for generations." Because much of maternal behavior is learned, Flo is a role model for her daughter Fifi. "The only stable social bond is mother - child." 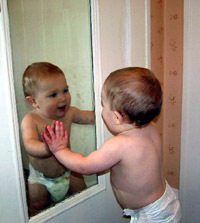 Males take no part in child rearing. Physical contact for its own sake seems to be a primary goal of chimp grooming, and chimps give reassurance to one another by touch. Chimps are stronger than humans, and if they lose their fear they could be dangerous. Nowadays, the researchers try to minimize all physical contact with the Chimps. Kenneth P. Oakley, Man the Toolmaker, Chicago, 1957. De Vore, Irven, ed. 1965. Primate Behavior: Field Studies of Monkeys and Apes. New York: Holt, Rinehart and Winston. Goodall, Jane. 1976. "Continuities Between Chimpanzee and Human Behavior." Human Origins: Louis Leakey and the East African Evidence, edited by Glynn Ll. Isaac and Elizabeth R. McCown. Perspectives on Human Evolution, vol. 3. Menlo Park, California: W.A. Benjamin, Staples Press Book, published for the society for the Study of Human Evolution, Berkeley, California. Goodall, Jane. 1963. 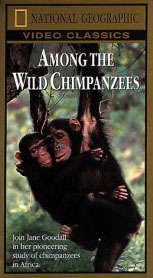 "My life Among Wild Chimpanzees." National Geographic, August, 1963: 272-308. Goodall, Jane, and David A. Hamburg. 1975. "Chimpanzee Behavior as a Model for the Behavior of Early Man: New Evidence on Possible Origins of Human Behavior." American Handbook of Psychiatry, edited by David A. Hamburg and H. Keith Brodie. New Psychiatric Frontiers, Vol. 6. New York: Basic Books. Harding, Robert S. O. 1985. Review of Among the Wild Chimpanzees. American Anthropologist, 87:4:979.
van Lawick-Goodall, Jane. 1975. "The Behavior of the Chimpanzee." Hominisation and Verhalten, Hominisation and Behavior, edited by Gottfried Kuth and Irenaus Eibesfeldt. Stuttgart: Gustav Fischer Verlag. van Lawick-Goodall, Jane. 1974. In the Shadow of Man. A Delta Book. New York: Dell. van Lawick-Goodall, Jane. 1967. My Friends the Wild Chimpanzee. Washington, D.C.: National Geographic Society. van Lawick-Goodall, Jane. 1970. "Tool-using in Primates and other Vertebrates." Advances in the Study of Behavior, vol. 3, edited by David S. Lehrman, Robert A. Hinde, and Evelyn Shaw. New York: Academic Press.